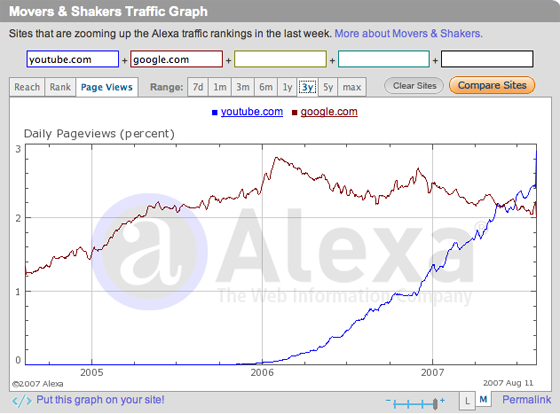 We’ve gotten a few “tips” that YouTube has actually grown larger than Google in terms of page views according to Alexa. This is, of course, complete fiction. And it shows just how useless Alexa has become as a method for measuring web traffic and reach. 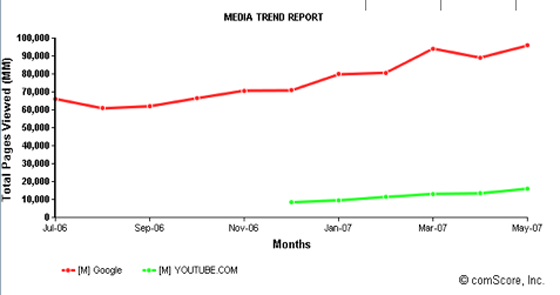 Comscore tells a much different (and more accurate) story – Google is nearing 100 billion monthly page views; YouTube sees around 16 billion. Even newcomer Compete, which measures traffic in a similar way as Alexa, seems to be getting it right. Alexa needs an overhaul. It’s long since become less than useful. For smaller sites it is understandable that Alexa may not have good data. But Google and YouTube are among the largest sites on the Internet. To get it this wrong is embarrassing.